Jakarta, May 16th, 2013 - Today, Archipelago International opened its 5th select service favehotel in Jakarta, the favehotel Kelapa Gading. The new favehotel Kelapa Gading is a mid seized budget hotel affording 121 contemporary guest rooms and facilities and amenities usually associated with more up market hotels such as 3 functional meeting rooms, an eclectic café, free high speed internet access, LCD TV sets with 60 local and international channels, top of the line beds with quality cotton bed linens and duvets, fluffy cotton towels, a full set of bathroom amenities and lap top seized save deposit boxes. The new fave enjoys a privileged located in the heart of Kelapa Gading in North Jakarta on Jalan Gading Indah Raya just behind the popular Kelapa Gading Mall and a few blocks from the Mall of Indonesia. Kelapa Gading is widely recognized as one of Jakarta’s most attractive neighborhoods, considered to be a city within a city known for its restaurant row with literally hundreds of popular eateries, great shopping and mid to upper class residential areas. Archipelago International’s Vice President of Sales & Marketing, Mr. Norbert Vas, said: “favehotels are attractive little budget hotels with a very cool design; they are super clean, professionally managed and blow most five star hotels away when it comes to “truly” high speed free internet and quality beddings while at the same time remaining incredibly affordable. We intend to add at least another 10 faves to Jakartas’ already exiting 5. Kelapa Gading complements fave’s current locations in Wahid Hasyim, Kemang, Pasar Baru and Pluit but we also will soon open in Melawai, Sunter, Cideng, Tanah Abang, Grogol, Menteng, Glodok, Cililitan, Zainul Arifin and Kebayoran. Snapshoot of Soft Opening favehotel Kelapa Gading - Jakarta, seen in the image (left to right) Mr. Buditama Setiawan as Hotel Manager favehotel Kelapa Gading, Mrs. Irawan Ambiadi as wife of Mr. Irawan Ambiadi that also as owner of favehotel Kelapa Gading, Dr. Hendra Susanto as owner of favehotel Kelapa Gading, Mr. irawan Ambiadi - Director of PT. Migata Anugrah Abadi that also as owner of favehotel Kelapa Gading and Mr. Norbert Vas as Archipelago International's Vice President of Sales & Marketing. 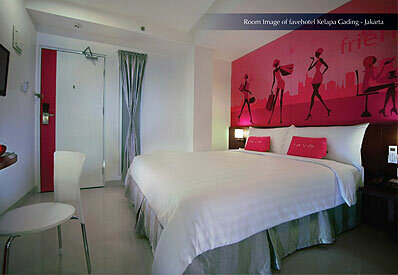 The Room of favehotel Kelapa Gading - Jakarta. Since its inception in 2009 favehotels have been in the forefront of the budget hotel sector redefining the industry’s standards for select service hotels through imaginative design, mid market features such as high quality beddings, complimentary high speed internet access and LCD televisions and have received accolades for their user friendly website offering instant easy bookings and best rate guarantees for internet savvy customers. favehotels currently operates 5 hotels in Jakarta, 5 in Bali, 2 in Bandung and Solo and 1 each in Balikpapan, Langkawi, Surabaya and Yogyakarta and has a large development pipeline in Indonesia, Malaysia and the Philippines. favehotels recently won the “Indonesian Best Budget Hotel Chain Award” and aims to be Indonesia’s best in class , largest and most consistent budget hotel chain promising uncompromising standards for cleanliness and safety and a network covering the entire archipelago. The group has announced plans to open more than 30 new hotels within the coming 2 years. Archipelago International (formerly known as Aston International) is one of Indonesia’s leading hotel operators with an underlying portfolio of more than 60 hotels and 12.000 rooms and a development pipeline exceeding 90 properties in Indonesia, the Philippines and Malaysia. Archipelago managed Hotels operate under the hotel brands Grand Aston, Aston, Aston City, Alana, Harper, Quest, favehotels, NEO and Kamuela ranging from ultra luxurious private pool villas to serviced apartments and select service economy class hotels, thus offering Indonesia’s vastest and most comprehensive hotel network.